Slim Fit vs Tailored Fit Dress Shirts: Which One is Best? One of the most difficult types of formal wear to decide on is a dress shirt, especially if you don’t intend on wearing a suit jacket on top. There are hundreds of different brands with an array of different colors, but overall, there are several different types of fits to take into consideration including slim, tailored, tapered, and loose. The most important thing to look at when you’re comparing slim fit vs tailored fit dress shirts is how they are going to appear when worn. Not everyone is going to love the idea of a tight-fitting dress shirt, and there are plenty of people who look best in a slim fit instead of a tailored fit. It’s also important to think about whether you have the ability to tailor the shirt or not, as well as the type of look you’re hoping to achieve. You would be surprised to learn that many people assume that tailored and slim fit dress shirts are identical, when in reality, they have subtle differences that can give you an entirely different look than what you were going for. The fit is particularly important, as it will determine whether your shirt looks like it’s designed for your body or if your body looks like it’s trying to fit into the shirt. With slim fit dress shirts, you’re going to be dealing with a tighter fit than with a tailored shirt, which is typically recommended for teens and young adults as well as the everyday modern man. With that being said, due to the fact that it fits tightly, it’s recommended to be worn by individuals who have a thinner frame with lean muscle mass. Due to its tightness, it can be incredibly uncomfortable to wear if you have a more athletic or average build. On the opposite end of the spectrum, a tailored fit dress shirt is going to fall in some where between slim and traditional fit. It’s still going to be tighter than your typical idea of classic fit dress shirts for men, but it won’t be as close to your skin as slim fit. This gives your body a little bit of wiggle room without having to worry about looking like you’re swimming in an over-sized top. If you’re an adult or an older male that isn’t too keen on the appearance of classic dress shirts, a tailored fit is probably what you’ve been looking for. There can’t be a clear winner between slim fit vs tailored fit dress shirts simply because it’s up to your personal preference. Although tailored shirts may offer a little more breathing room, they’re not the ideal choice for thinner men and a slim shirt is generally not the right choice for bulkier bodies. If there’s one thing every man knows it’s that at one point or another they will have to get their formalwear tailored to their bodies – especially for special events such as weddings. This is why it is incredibly important to make sure you choose the right shirt that will allow for tailoring, otherwise you’ll be stuck searching for the perfect size right off the rack. When it comes to slim fit dress shirts, tailoring is going to be relatively impossible as they are designed to cling close to your chest and hips. This leaves little to no fabric left for alterations, meaning that you’re going to have to spend a lot of time finding the perfect collar size, shoulder size, and waist size to accommodate your body type. With that being said, men with thin frames are going to find this simple as they don’t have to worry about muscles or curves in their body. However, if you’re a bigger man searching for a slim fit dress shirt you can spend hours looking for the ideal size that feels and looks comfortable. In comparison, tailored fit dress shirts are phenomenal for tailoring as they give you a comfortable amount of fabric to use to your advantage. 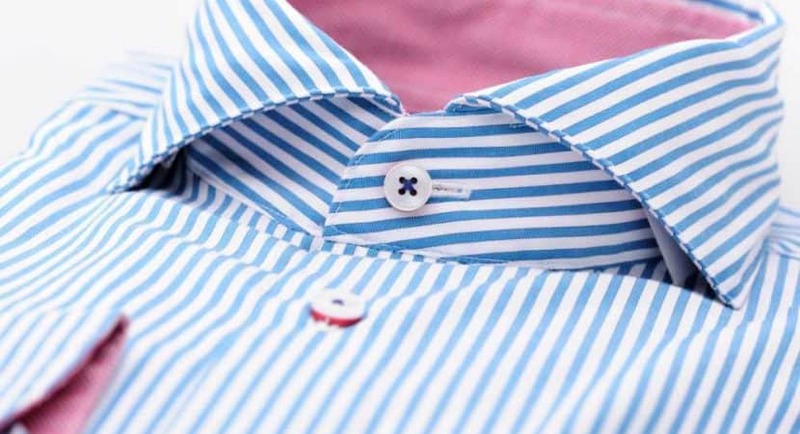 You can buy a tailored shirt that is close to your size and bring it into a tailor to bring up the sleeves, shoulders, or even the length of the shirt. It gives you a little more room in terms of customizing the fit of the shirt to your unique body size which can be quite important. By far, having the ability to have your shirt tailored is a great opportunity, which is why a tailored fit dress shirt is the clear winner in this regard. Although these shirts are designed to fit your body as perfectly as possible, you might want to have a couple of areas adjusted and with the extra material used during the designing process, you have room to do so. Not every man has an interest in spending hours perfecting their aesthetics, however, it is important that you always put your best foot forward, especially if you’ll be making first impressions. When it comes to your aesthetic, it’s all up to personal preference, but it’s important that you stay true to current trends. Slim fit dress shirts will always be seen as a younger yet modern way to accentuate your personal style. This is because they are most often worn by teens and young adults that don’t have to worry about muscle mass or a changing body type. They’re the perfect choice for prom as they accentuate youth, style, and modernism. Tailored fit dress shirts can be equally as modern as slim fit shirts, but they appear to be a little older which makes them the perfect partner for adults and classic men that are interested in enhancing their style. With a tailored fit shirt, you’re going to be able to wear it through the years as it will never go out of style. It’s the perfect mix of slim and traditional, giving you comfortable formalwear meanwhile adapting to trends. At the end of the day, the most important part of choosing formalwear is to make sure that you have a piece that is going to stay relevant through the years and as your body changes. By far, a tailored fit dress shirt is your best option as it encapsulates the true idea of modernism meanwhile giving you the ability to have the shirt tailored to adapt to your size. Overall, tailored fit dress shirts are your best choice as they give you customization options in terms of fitting the shirt to your body, instead of the other way around. With a contemporary look that is appropriate for all occasions, you can’t go wrong with opting for tailored over slim fit dress shirts. In case you weren’t aware, non-custom suits are measured by the wearer’s chest and come in three separate dimensions: short, regular and long. It’s important that you understand what your basic measurement is, so that you can start with a jacket that will require the least amount of tailoring to your frame.